GENEVA COLD I don’t know if you guys ever have this feeling before going out on a date or a meeting, like you just picked out the most awesome outfit ever, you’re absolutely proud : and then once you’re back home and you look at yourself again in the mirror you just realise ”what was I even thinking about?!”. The shoes absolutely don’t match, the hat looks ridiculous, bref a very bad fashion day. Well this is the feeling I had yesterday. And of course, I show you this outfit anyway because I am a highly honest person who shows it’s mistakes too : oh yes, yes I do (that might not be entirely true)… I thought overlaying jackets and coats and so on would look interesting, and warm by the way, but at the end I am not very satisfied with the result. It looks too big, though I must admit it was an extremely comfortable look. What do you think about this outfit guys? I want to know your opinion. So James and I tried to do our best out of the pictures : it was a cold afternoon and I was happy to actually be wearing all those layers even if I really looked like a gigantic cupcake. You’re authorized to laugh at me of course. On a bright side, I was more than excited to wear my new Swarovski bangle which I received from the brand a couple of days ago, thanks again for this gorgeous gift. If you re following me on instagram (@kristina_bazan) then you must have already seen it. Anyway, you’ll find out some more about this very special bracelet in a future article. I just couldn’t wait to wear it and it seemed like it matched perfectly my camel shades outfit. James and I have spent the day with the lovely Rita&Zia girls at their concept store in Geneva, the only thing I can say is that you guys can expect some beautiful surprises. You look absolutely great! The fur looks very cool in the outfit, what is it a scarf? Photos are stunning like always! Hat, fur and bag are fabulous accessories! Such a pretty, feminent look! I love the coat. Great look, love those shoes! love the look! that bag is incredible! You look very chic! and the hat put the extra special in the outfit! Your outfit looks great and the colors match to each other! You look so glamorous with a dose of boho! "gigantic cupacke! hahaha that the perfect word :D no, i like your outfit, but maybe i would have worn it without the fur vest. but it looks, as you said, really comfy :) looking forward for your article about your new bracelet. PS: i love that you are a highly honest person = very precious! The outfit is so cute!! The outfit looks beautiful - and "not too much"... nice combination...! Kristina you are too critical about your outfit - it looks absolutely stunning! You can do no fashion wrong in my eyes ;) Hope all went well with your bag launch yesterday! Kristina sweetie why are you so hard with yourself?? This is such a lovely fall look, really refreshing layering! I think you look fab as usual! :) Love the bracelet! and aww these shoes are a dream! I think you look great, the colors suit you really well! For me you look perfect! I love your outfit! The outfit isn't that bad as you might think. Actually it looks quiet stylisch with the overlaying look, even though you really are wearing a lot of different Brown shades. ;-P What I really would have changed is the bag. I'm in lvoe with your eye make up! It's fantastic! This is one lovely look... but I know that feeling, too. Tu es superbe comme d'habitude ! La manchette est vraiment trop belle ! J'espère que ta soirée d'hier s'est bien passée. J'ai vu quelques photos il y avait l'air d'avoir de l'ambiance. J'espère pouvoir venir à la prochaine. Stunning Make-up, love this bronze eye look! I don't think this outfit is a mistake at all! I totaly love it! You look perfect in these colours, shoes are incredible, your face, hair, make up - perfect as usual! Amazing look You're so beautiful! You could wear a paper bag and make it stylish, I have no doubt! You look great! 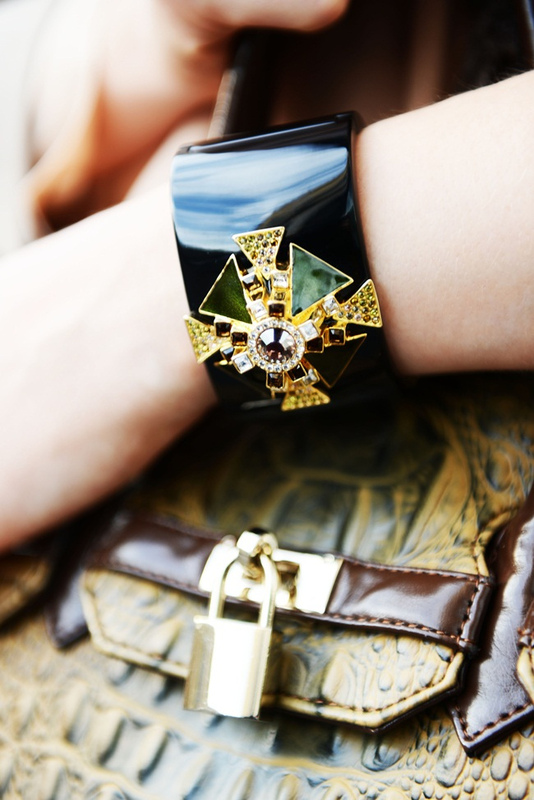 Loving the bracelet - reminds me of Coco Chanel's Verdura cuffs. I know the feeling! Happens too often, ha. however you are out of your mind, this look is so chic! This is really an interesting mix of textures and shades. I absolutely love it! I really dont agree with you! I do like your outfit very much! Your bag is fantastic !!! i don't bout the layering for you still look wonderful...but...I LOVE the bracelet!!! The outfit is absoluetely amazing, so classy! You make the other girls look awful! :`( Poor me, you are suuuuuper nice! honestly, you look totally chic! loving this look and you're so thin that you can pull off big on top with the tights and stiletto heels on bottom! Those shoes are amazing! :) Honestly, it could have been better without the fur, or maybe with a fitted burgundy dress for less bulk. Anyway, it's still cute! I love the look, everything matches well:) don't worry! You definately don't look like a gigantic cupcake in my opinion! I think you're just as beautiful as always :) But I do think it would look better without the hat... loving the fur though! Beautiful layering, adore the fur! So chic *_* love your style! I'm not crazy about the bag, but apart from that I can't say a negative word about this look. Could you please tell us what eyeshadows and nailpolish did you use ? I really think this makeup is stunning ! Je pense que le problem venait du chapeau.. Le fait de mélanger la fourrure et l'imprimé peau de serpent était deja assez risqué alors le chapeau (meme si je le trouve vrm très beau!) en plus ca fait un peu "too much". Aww but I really liked your outfit! You don't look at all like you described! The hat is gorgeous, I don't know what you mean about an awful outfit. You look lovely. I honestly can say I don't hate the look. It's not your best look yet, but it's not terrible. And fashion is all about experimenting and taking risks. Sometimes it works and sometimes it, well, doesn't. wow beautiful Girl!! Love your Pictures!! You look amazing! and your eyes...i'm speachless! The shoes totally match! no worries ! Well... Maybe you should have put the fut over the coat, but it's not that bad ! I like the layering, although I think the bag doesn't really match the rest of the outfit and you could've added more structure to the look, a belt or something similar. The fur and the snake print are a bit too much, take out the bag and I think it looks cute! I love this outfit! It's so editorial..
lovin the mix of brown color, you styled it great! GREAT FALL OUTFIT! Love all the layering and the hat is sooo chic. I think you look fabulous in all of the pictures, and you look very stylish. Love that trench! how i know these days:). but you're look is really great apart from your hut.. i think it doesn't fit to this outfit. but like always i like you're style! Great outfit. the purse looks a little out of place, but apart from that everything is perfect. I think the layering works and you look fabulous!! Im a huge fun of the trench - coat you have!!! Your makeup is always amazing! gorgeous photos you look stunning!